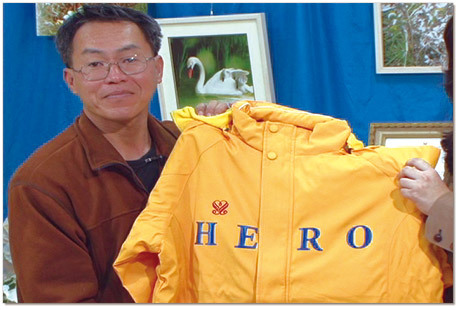 On December 23, Golden Year 7 (2010), our Association members from Kaohsiung Center presented, on behalf of Supreme Master Ching Hai, the Shining World Hero Award to Mr. Chen Shueh-jen for his heroic action in saving more than 400 canines when a typhoon swept through southern Formosa earlier in September. Many years ago, Mr. Chen had built the Aranya Dog Sanctuary on a piece of farmland in Gangshan. He wanted to express his respect for all life by providing a refuge for our homeless animal co-inhabitants. The sanctuary is now home to more than 400 dogs. When Typhoon Fanapi brought heavy rainfall last year, water rose four meters high and quickly submerged the sanctuary. Instead of fleeing for his life, Mr. Chen chose to stay and single-handedly transferred his 400 canine friends to higher ground. In spite of the cold and wet conditions, they survived two long days before being rescued, thanks to half a bottle of mineral water and some dog food. Upon knowing of Mr. Chen’s heroic act, our Association members visited Aranya and contributed vegan dog food for his canine friends who had just survived the ordeal. Mr. Chen told our Association members that respecting life is not merely a slogan but an ideal that has to be realized through action. He had established the sanctuary as an educational venue for learning to respect life, so that more people could understand that animals are—and must be treated as—our equals. 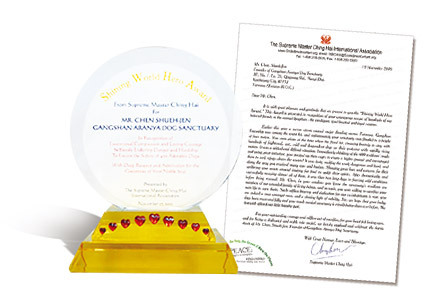 For his courageous and selfless action, Mr. Chen received the Shining World Hero Award and a contribution of US$10,000 from Master to assist with the reconstruction of the sanctuary. On behalf of his canine friends, he expressed his deepest gratitude to Master for the timely gift that would help him complete his project. We are thankful to Mr. Chen for embracing the noble ideal of building a warm haven for his beloved dogs. May he and his canine friends be forever blessed with Heaven’s love and grace.